Most guitars that attempt to provide the full range of single-coil and humbucking tones in one instrument usually fall short in one way or another. Either the single-coil tones aren’t convincing enough or the humbucking tones fail to deliver the body and full-on roar most players desire. The Framus D-Series Diablo Pro takes on the challenge of combining traditional dual-humbucker tones with the classic triple single-coil lineup using a design featuring a full-size humbucker at the bridge, a traditional single-coil pickup in the middle and a single-coil-size humbucker at the neck, with coil-splitting thrown in for good measure. This circuit combined with a carefully selected combination of tone woods offers guitarists the true performance of “two guitars in one” and much more. 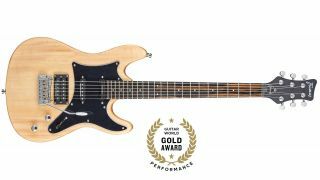 FEATURES Framus made a few notable changes to the current D-Series Diablo Pro from the previous version of the model, including a basswood body, maple neck and tigerstripe ebony fretboard (previously swamp ash, ovangkol and rosewood, respectively). The model still features similar neck specs such as a 25.5-inch scale length, 22 jumbo frets and a 12-inch radius, and it still offers bolt-on construction with the neck solidly affixed via an ingenious two-bolt design. Other notable features include a Wilkinson-style non-locking tremolo, Warwick security strap locks and Framus’ patented Easy Access cover for the control compartment. The pickups are all Seymour Duncan models, consisting of a TB-4 JB full-size humbucker at the bridge, an SSL-1 single-coil in the middle and an SCR-1n Cool Rails Strat-size humbucker at the neck. A coil-splitting function for the bridge and neck humbuckers is activated by pulling up on the master tone control, and a five-way pickup selector accesses bridge, bridge/middle, middle, neck/middle and neck settings. PERFORMANCE The Diablo Pro’s basswood body and maple neck with ebony fretboard is a proven winning tonewood combination that provides aggressive attack, full-bodied midrange and impressive sustain. The Seymour Duncan pickups perfectly complement this tonewood combo by providing harmonically rich humbucking tones with tight bass, vocal-like midrange and articulate treble and single-coil tones with percussive snap and impressive body. The Diablo Pro provides all of the classic Strat tones players love as well as hard rocking dual humbucker tones with more aggressive upper midrange/treble response. The Diablo Pro is exceptionally comfortable to play, boasting a fast, slim neck that combines the best of favored vintage and modern shred designs. If you’re looking for a single guitar that can get you through an entire gig without needing to change instruments, the Diablo Pro is a very worthy choice.